The title to one of D.G. Hart's posts here. One might object that nothing in the preceding section [on Calvinist political thought] is distinctive to the Reformed tradition. Indeed, Quentin Skinner has argued that Protestant resistance literature is not “specifically Calvinist at all” but that these ideas are borrowed from Scholastic authors. As a matter of the genealogy of ideas this may be the case, but what is critical for the purposes of this book is that these ideas were most extensively developed, defended, and applied within the Reformed tradition. 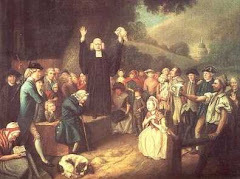 Within a generation of Calvin, virtually every Reformed civil and ecclesiastical leader was convinced that the Bible taught that governments should be limited, that they should be based on the consent of the governed, that rulers should promote the common good and the Christian faith, and that unjust or ungodly rulers should be resisted or even overthrown. 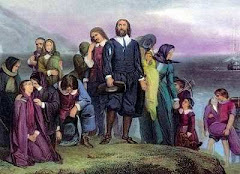 Whether these ideas are inherently connected to Calvinism, the Reformed tradition became a major means by which they became a part of American political culture. Heh. I used precisely that quote in the comments section. Cheers. "From Billy Graham to Sarah Palin: Evangelicals and the Betrayal of American Conservatism"
The very idea of the existence of a "Calvinist resistance theory" that gives a theological justification to political revolution is unacceptable to him as a Calvinist, therefore he disavows any necessary theological connection--Calvinist revolutionaries are by definition in conflict with "true" Reformed theology--Calvinist resistance theory isn't truly Calvinist atall. Unfortunately, that's a theologian's argument, not a historians's. Unfortunate too then that Darryl G. Hart is the author of "Calvinism: A History." Are We Looking for Gnats in the Soup?